Feeling hot, hot, hot playing at Bournemouth Bandstand! 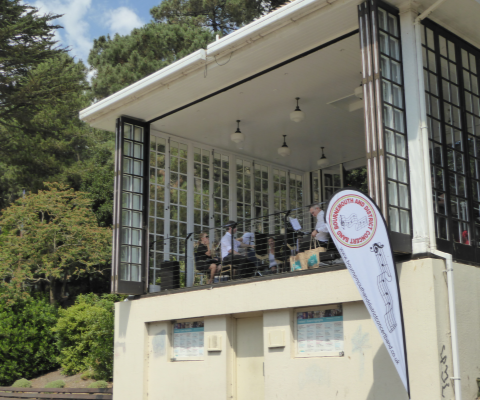 With the UK gripped by football fever and a heatwave, Bournemouth Gardens was set to be packed for both of BDCB’s Sunday afternoon bandstand concerts. Our first appearance on 1 July saw soaring temperatures and a muggy afternoon. Kicking off with a fantastic rendition of The Lion King, the tunes came thick and fast with songs from Jersey Boys, Jurassic Park and The Greatest Showman to name but a few. With the imminent release of The Incredibles and Mamma Mia sequels, Dimitri, our Conductor, made sure the programme was topical. 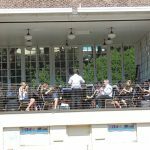 The usual band line-up was supported by Abi on French horn, Andrew on Tuba, Bill on Tuba, Melissa on Percussion, Liz on Bassoon and Phil on Baritone Saxophone – all of which sounded amazing and there was some fantastic sight-reading from many of them! Our second and final Bandstand gig on 8 July had stiff competition from the Future Cheer Internationals competition – an annual cheerleading event. Many of the troops had spilled out of the Bournemouth International Centre (BIC) to enjoy the sunshine and were entertaining the crowds with amazing lifts, throws and moves that left us watching in amazement from our elevated prime view. Big shout out to Tony who provided some lovely French horning. Steve, normally clarinet, confused some of the flutes by switching sides and playing alto saxophone. Louise and Emma also stepped forward to sit on the front row of the flutes after some horrendous traffic saw some players stuck and unable to find parking. Fair play to Martin on Tuba, who after spending 2.5 hours to get from Southampton, managed to momentarily catch his breath before blasting out the bass line. 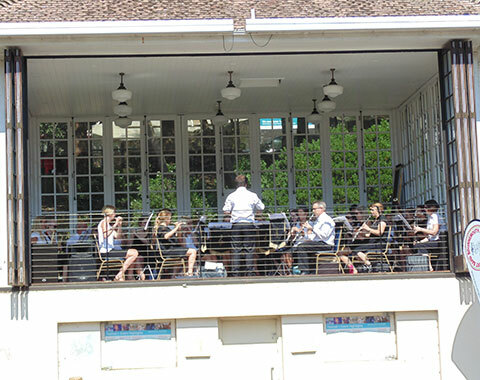 Thank you to the audiences who endured the baking sun and well done to the band who sizzled inside the bandstand. The collection buckets were rattling at the end of both performances and we look forward to being back next summer. What’s a band rehearsal like? Play a brass instrument? Join us in the back row!